The North Korean government is despotic and cruel — but sometimes it’s just plain strange. Like the time it claimed the late Kim Jong Il (5’3” in heels) shot 38 under par on the golf course. Or, for a more recent example, look at its official Twitter feed. Jimmy, the guy in the picture, is reportedly just an ordinary 25-year-old fron Texas. 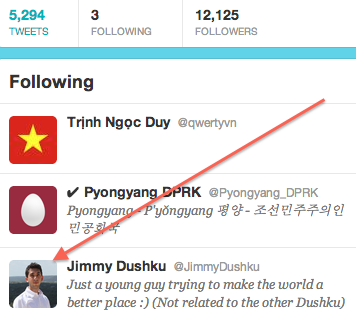 Twitter users have accused him of being a spy but he says he has no idea why North Korea follows him. “I was initially surprised, but I always try to make friends with people from all different locales and backgrounds,” he told Mother Jones, who first reported the story. It’s a very great information by you, thanks for sharing. socialbakers, hootsuite and socialkik are good sites for social media.